A Tribute to the Music and Vocal Harmonies of the Everly Brothers!! From their first hit in 1957 to the current day – The Everly Brothers remain the world’s most loved vocal duo. Their sound – with it’s wonderful close harmonies has influenced The Beatles, The Beach Boys, and many other artists. 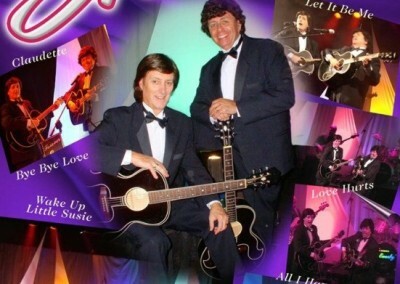 David Lee-Jay and Martin Norris are both entertainers with a vast wealth of experience. They have both toured the world, worked in television and radio, and appeared with many named artistes. David has toured throughout the world as an entertainer, and was a member of several UK 60’s chart topping bands. He has appeared on television in Europe and Scandinavia, recorded for EMI, and is much in demand as a session vocalist and musician. Martin worked extensively in television in Southern Africa, and has written and directed many television programmes. His song writing and production skills have bought him many awards, including gold records, Mobius Awards, (Chicago ), Sunnie Awards(Qld), and New York Film and TV Awards. 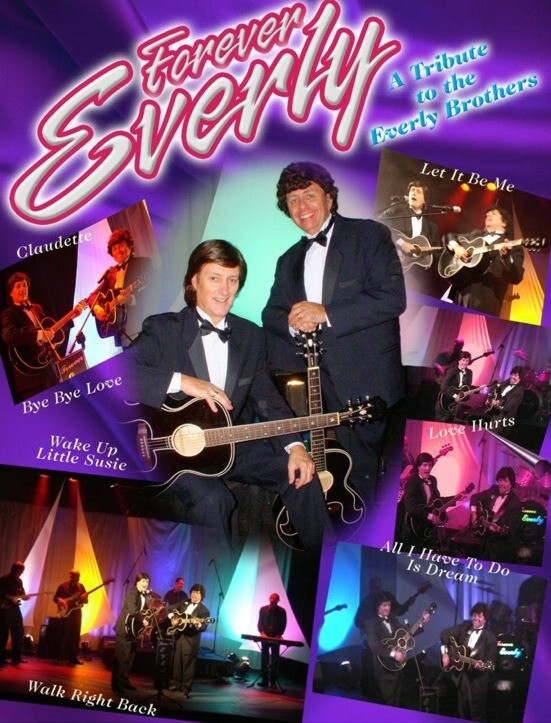 Together they are “Forever Everly”, and provide a show that recreates the music and soaring close harmonies that are the trade marks of the EVERLY BROTHERS. Bye Bye Love, Bird Dog, Walk Right Back, Claudette and Let It Be Me are just some of the EVERLY BROTHERS hit songs that are included in this show. Add to these, some of their recordings of country, rock and roll and sing-a-long songs right through to their Paul McCartney hit in the 80’s – “On the wings of a Nightingale”, and you have a show that will please everyone.